Bwindi Impenetrable National Park is sited in the South Western part of Uganda along the border with Democratic Republic of Congo (DRC) next to Virunga National Park in DRC. The park covers a total land area of 331 square kilometers (128 sq comprised of both montane lowland forests and can only be accessed by foot due to the thick forests and the rugged nature of its terrain. Bwindi is also very rich in fauna with over 120 mammal species, of which 10 are primates and more than 45 small mammal. Mountain gorillas are the popular primate species and over 480 gorillas live in this tropical rain forest. The national park is therefore the best place to go for gorilla tours rewarding travelers to spend time with these amazing species. Besides gorillas, Bwindi is a home to some chimpanzees, L’Hoest’s Monkey, African elephant, African green broadbill and Cream-banded swallowtail, black and white colobus, red-tailed monkeys, vervet, the giant forest hog and small antelopes. Carnivores like side-striped jackal, African golden cat and African civet can also be found in the park. There are also over 350 bird species and more than 200 butterfly species. Various fish species can also be found in the Park’s Rivers and streams. The park lies at the edge of the up-warped Western Rift Valley in Kigezi Highlands with a very rugged topography accompanied by narrow valleys with a complex network of Rivers along its steep hills. The altitude in the Park Range from 1,190 to 2,607 meters (3,904 to 8,553 ft) above sea level. it is also important to note that over 60% of the park has an elevation of above 2,000 meters (6,600 ft). The national park experiences tropical climate characterized with an annual mean temperature range of 7 to 27 degrees celicious and annual rainfall ranges from 1,400 to 1,900 millimeters. The peak rainfall is received in March to April and September to November. 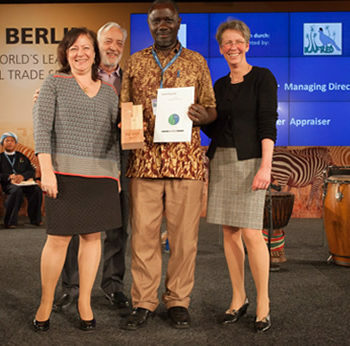 Bwindi impenetrable forest national park was garzetted in 1991 together with the sister Mgahinga gorilla national park purposely to conserve mountain gorillas and promote gorilla tourism. Uganda Wildlife Authority, a government body in charge of wildlife conservation and Tourism in Uganda, manages all tourism and conservation activities in these parks. The nearest local town to the park is Kabale in the South East, which is 29 kilometers (18 mi) away from the park by road. Also, Bwindi is a water catchment area with a dense network of water streams from heavy rainfall in the park and because of this, many Rivers have resulted from these streams. The major ones include; Ivi, Munyaga, Ihihizo, Ishasha and Ntengyere Rivers which flow into Lake Edward. Other Rivers from the park flow into Lakes Mutanda and Bunyonyi. 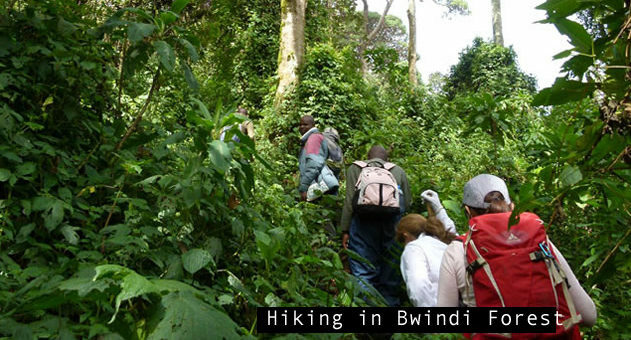 Therefore besides tourism, Bwindi is a source of domestic and agricultural water for the local communities adjacent to the park. In terms of biodiversity, the Bwindi Impenetrable National Park is biologically rich. The park has the richest population of trees in East Africa in its Afromontane forests, which is a rare vegetation type in Africa. Over 220 tree species can be found in the park, which makes more than 50% of all Uganda’s tree species. Among these, there is rare white Mahogany threatened plant specie found within the park. The vegetation provides food and habitation to mountain gorillas together with other animals and bird species in the forest. Gorilla trekking is the main tourist attraction for most if not all travelers to Bwindi impenetrable forest national park. The park shelters over 400 mountain gorillas, which have been habituated into 12 gorilla groups available for trekking. Surprisingly, this number makes up almost half of all the mountain gorillas in the world which shows you how the park is hugely blessed with this kind gorillas and hence the best destination for gorilla safaris in the whole world. The rest population of gorillas in the nearby Virunga Mountains of Rwanda’s volcanoes national park and the Democratic Republic of Congo in Virunga national park. Most of Uganda’s gorilla tours are made to Bwindi Impenetrable National Park because of the presence of these numerous mountain gorillas in the park. Away from gorilla trekking, Chimpanzee tracking is also another good tourist attraction at the park. The chimps can also be seen in the nearby neighborhood to those of the gorillas. 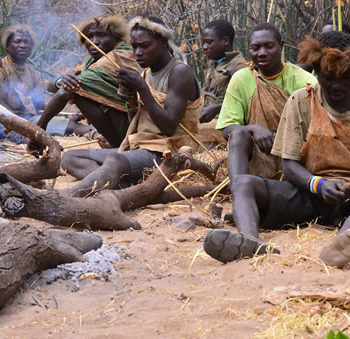 They also offer an incredible experience to tourists with their human like behaviors. Monkey watching and bird watching also offer an extra enjoyable experience to tourists after exploring the gorillas and chimps. The park has rare monkey species like the golden monkeys and the red tailed monkeys that are always entertaining tourists with their canning plays and fights. A variety of bird species ranging from small to big can also be watched at the park, which is also a breathtaking moment. All travelers to see gorillas in Bwindi must have valid gorilla permits as a pass to see these gentle giants in their natural habitat. A single gorilla permit in Bwindi costs 600usd and it allows travelers to spend an hour with mountain gorillas. Fortunately, foreign residents pay 500usd while east African residents pay 250000shs which is an added advantage. However, gorilla trekking costs of accommodation and transport to the park are not included in the above gorilla permits. Booking gorilla-tracking permits in advance is very essential as they always have a limited availability. Gorilla trackers are advised to book for permits at least 3 months in advance. Bwindi Impenetrable Forest National park can be accessed by both road and air transport means. By road, Bwindi can be reached via Kampala-Kabale-Kanungu-Buhoma route, which takes 5-6 hours. Another route is that of Kampala-Ntungamo-Rukungiri-Kihihi-Buhoma. This is the easiest and most convenient route and has about 390km in addition to the marram road to Buhoma. By air, travelers can either decide to fly from the main Entebbe airport or from Kajjansi airfield. These flights will lead to one of the three airstrips around the park, which include the tarmac airstrip at Kisoro, Kayonza and Kihihi airstrips. To ensure a successful and enjoyable gorilla safari to Bwindi impenetrable forest national park, a ravel must have a fully equipped packing list. Among your list of items you should carry include hiking boots for easy movements, garden gloves to protect your hands during your gorilla tracking adventure, a rain jacket to deal with unpredicted forest rains and sun glasses/hut to protect from direct sunshine. You will also need a long sleeved shirt or blouse together with a pair of jean trousers, which protect from insects like the safari ants that may disturb your gorilla trekking experience. Energy giving snacks and enough drinking water are also recommended to boost you during the exhausting gorilla trekking journey. A pair of binoculars will also help you to view some of the distant species like birds, monkeys, chimps and other primates. Finally you may need to pay a porter to give you a push or a pull during your gorilla trekking as the gorillas may be far. 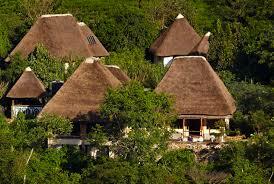 Mantana Luxury Tented Camp, Gorilla safari lodge, Bakiga lodge, Gorilla mist camp, Mahogany springs lodge, Chameleone hill lodge. All these lodges have experienced staff to welcome and serve travelers any time. The prices charged vary depending on the standard of the lodge (luxury, midrange &luxury) but travelers are assured of quality services. The park is open for wildlife viewing and gorilla safaris throughout the year. However, the best time for a traveler is from June to August and December to February because these are drier months and therefore forest trails are not impassable and slippery. Washing hands before you go for Gorilla trekking. Keep your voices low, by keeping your voices low this enables one to look out for different mammals in the forest, remember it’s a forest which protects and inhabits a number of birds, mammal by lowering your voices you will have a chance to see more of the inhabitants of the forest. Do not live the Rubbish behind during your trek, the animals might eat the Rubbish and die; always keep all the Rubbish in bags and go back with them. Always stand 7meters away from the Gorillas; the more you stand back the more relaxed they become to continue with their day to day life, observe them closely as they eat, play, groom each other, display their nests such a beautiful encounter. Always keep your voices low, however questions are allowed to be asked in case you need to know more. Stay in tight groups of eight do not move around the Gorillas may take charge, do not look direct in their eyes and do not run away this may increase the risk. Do not to touch the Gorillas these are ‘wild animals’. Do not eat, smoke, drink this may live the droppings causing the Gorillas to eat and might lead to transmission of diseases. Flash Cameras with lights are not allowed during the trek. The maximum time to spend with the mountain Gorillas is 1 hour. After all that time spent with the mountain Gorillas move 200 meters away and start talking, but in a low voice. Conclusively therefore, Bwindi impenetrable forest national park is a place to visit. Book a Uganda safari to Bwindi, enjoy gorilla trekking and other tourism activities in the park.